Over the weekend, the U.K. announced that they are willing to offer Ireland a direct loan of GBP7 billion. With a large budget deficit of its own and the prospect of austerity measures that is expected to dampen growth, many critics have wondered if the U.K.’s government’s proactive offer is in the country’s best interest. Unfortunately the answer is yes because U.K. banks are heavily exposed to Irish banks. 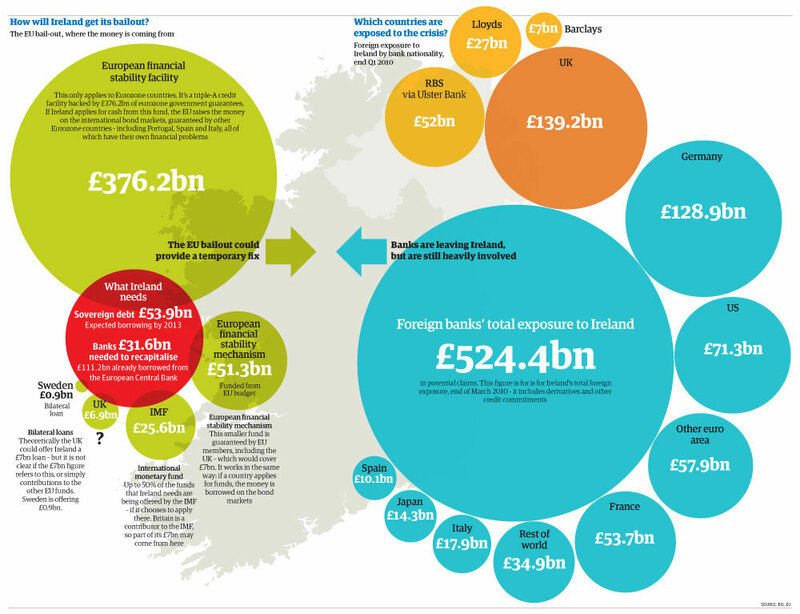 As BoE Governor King pointed out last week their exposure is “by no means trivial.” While “the direct holdings of Irish sovereign debt are not especially large,” the ownership “of securities issued by Irish banks are bigger and of course there are wider exposures to assets comprising loans to the Irish economy more generally.” Of all the major countries, the U.K. has the biggest bank exposure to Ireland, followed by Germany. To prevent a banking crisis of their own, the U.K. government felt the need step up and provide support to Ireland before is too late. The Guardian has some wonderful charts and tables detailing to exposure of various countries. It is definitely worth a look. Here is sample. Click on the image to access their full Datablog on which countries are most exposed to Ireland and who will be next.